სტივენ ელისონი (ინგლ. Steven Ellison; , ცნობილი მეტსახელით Flying Lotus ან FlyLo; დ. 7 ოქტომბერი, 1983) — ამერიკელი მუსიკალური პროდიუსერი, ელექტრონული მუსიკოსი, DJ და რეპერი ლოს-ანჯელესიდან. Flying Lotus-მა გამოუშვა ხუთი სტუდიური ალბომი — 1983 (2006), Los Angeles (2008), Cosmogramma (2010), Until the Quiet Comes (2012) და You're Dead! (2014) — და შვიდი EP. 2012 წლიდან დაიწყო რეპ გამოსვლები ფსევდონიმით Captain Murphy, იმავე სახელის მქონე ანიმაციურ სერიალ Sealab 2021-ის პერსონაჟის მიხედვით, რაც გამჟღავნდა მისი პირველი რეპ მიქსტეიპის, Duality-ის, გამოცემის შემდეგ. Flying Lotus-მა აღნიშნა, რომ მასზე გავლენა მოახდინეს მუსიკოსებმა: Madlib, MF DOOM და J Dilla. ის ცნობილია ექსპერიმენტული ჰიპ-ჰოპით, ალტერნატიული ჰიპ-ჰოპით და ელექტრონული მუსიკით, ხშირად იყენებს ბლუზს და ეისიდ-ჯაზს თავის მუსიკაში. მთავარი სტატია : Flying Lotus-ის დისკოგრაფია. ↑ Weiss, Jeff. “Flying Lotus' Nocturnal Visions“, October 4, 2012. წაკითხვის თარიღი: March 15, 2013. დაარქივებულია ორიგინალიდან - March 15, 2013. ↑ Brown, Marisa. 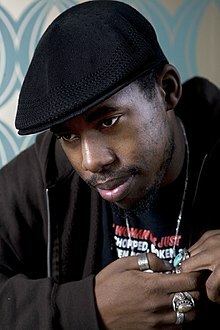 Flying Lotus - Biography. Allmusic. Rovi Corporation. დაარქივებულია ორიგინალიდან - March 15, 2013. ციტატა: „Experimental electronic music producer Flying Lotus... mixes electronic-flavored hip-hop with jazz influences.“ წაკითხვის თარიღი: March 15, 2013. ↑ Flying Lotus Profile. Metacritic. წაკითხვის თარიღი: 2012-09-30. ↑ Ware, Tony (September 28, 2012). "Moving Forward by Dialing Back on Until the Quiet Comes". Electronic Musician (New York). http://www.emusician.com/artists/0767/flying-lotus/149551. წაკითხვის თარიღი: 2012-10-13. ↑ Martins, Chris. (2012-11-29) Flying Lotus Is Captain Murphy, Drops 'Tiny Tortures' Video Starring Elijah Wood | SPIN | Newswire. SPIN. წაკითხვის თარიღი: 2013-07-04. ↑ Flying Lotus "You're Dead" Release Date, Cover Art, Tracklist & Stream. HipHopDX. წაკითხვის თარიღი: 6 October 2014.
ეს გვერდი ბოლოს დარედაქტირდა: 09:00, 24 სექტემბერი 2018.